A sterling debut at top level has earned Morningside teenager Nathan Colenso the Round 1 Rising Star nomination. The 17-year-old found himself matched up against Labrador star Wayde Mills as a half-forward in the season opener at Cooke-Murphy Oval on Saturday, but he overcame nerves and went on to kick three nice goals in his first seniors match for the Panthers. 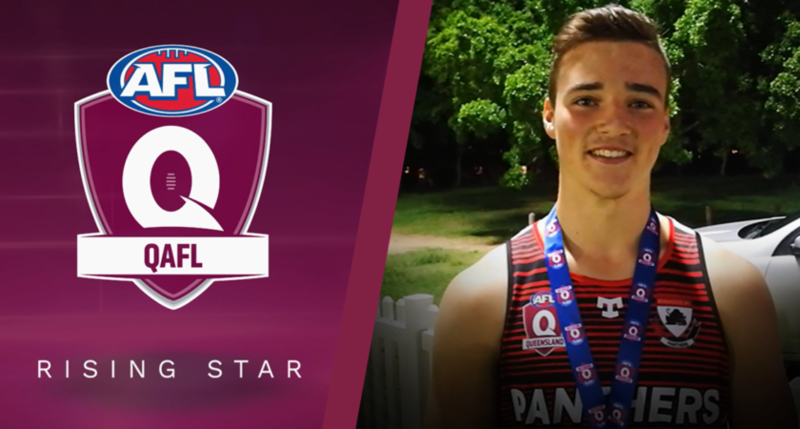 It was a promising start to what Colenso hopes will be a career that goes on to higher levels and it was worth noting coach Clint Watts’s comment that the youngster did not look out of place at QAFL level. Colenso was a member of Park Ridge’s 2018 premiership side in the QFA Division 2 Grand Final and attracted the interest of three QAFL clubs – Morningside, Mt Gravatt and Western Magpies. A good sized youngster at 185cm and high-80kg on the scale, Colenso settled for Morningside and was happy with his debut performance for the tricolours. “It was different to what I was used to,” Colenso said after his opening game. An apprentice cabinetmaker, Colenso does not turn 18 until November, by which time and providing he continues his progress, he should attract interest from NEAFL recruiters, maybe some from the highest level at AFL. “If the opportunity comes up I’ll take it with both hands,” Colenso said when asked if a place at a NEAFL club is on the radar. That Colenso has plenty of football ability does not surprise given that his father Andy was something of a name in the QAFL in the 1980s. As a youngster Colenso captained a Queensland Teal Cup Under 18 side and earned All Australian honours. Colenso Snr played at Coorparoo and was in premiership sides with the then powerful Roos. In the 1984 Grand Final he played alongside one Jason Dunstall when the Roos beat Morningside and in 1986 he was a member of a Coorparoo side that rewrote this history books with the biggest turnaround in local history. That year, when Colenso was club best and fairest, Coorparoo lost the second semi-final to Southport by 98 points. The Roos then beat the Sharks by 10 points in the grand final a fortnight later. In his heyday Colenso Snr was invited to train with Collingwood, but he was plagued by injuries and finished with Williamstown in the VFA. He returned to Brisbane and the old Bears had him on their AFL supplementary list before he lined up with the old West Brisbane. But there is one side of father Andy’s make-up that Nathan intends to never match, nor even get close to. Andy was a feisty customer who frequently landed himself in trouble with match officialdom. One year he was suspended three times, for a total of 16 matches. Nathan laughs about statistics like that. “Dad used to get reported a lot, but I’m different, I’m a more civil person,” he joked.